Some people suffer from allergies year round and are usually allergic to dust mites, animal dander, feathers, and molds. 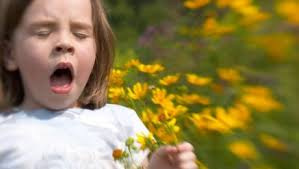 Seasonal allergy sufferers are usually affected by pollens from plants, weeds, grasses, and trees. The body perceives the pollens as foreign and produces histamines into the bloodsteam causing typical allergy symptoms: congestion, sneezing, itchy or runny nose. Sufferers also experience fatigue and poor concentration as well as an increase in asthma symptoms and ear and sinus infections related to the congestion from seasonal allergies. -Talk to your doctor about the use of prescription or over the counter meddications. -Keep windows closed and use air conditioners to filter out pollen. -Limit outdoor activity between 5am and 10am especially on hot, dry, windy days when pollen counts are highest. -While the lawn is being mowed, keep allergy sufferers indoors as pollens get stirred up in the air. - Use your clothes dryer instead of hanging clothing outdoors to dry. -Take a nighttime bath to wash off allergens before going to sleep.